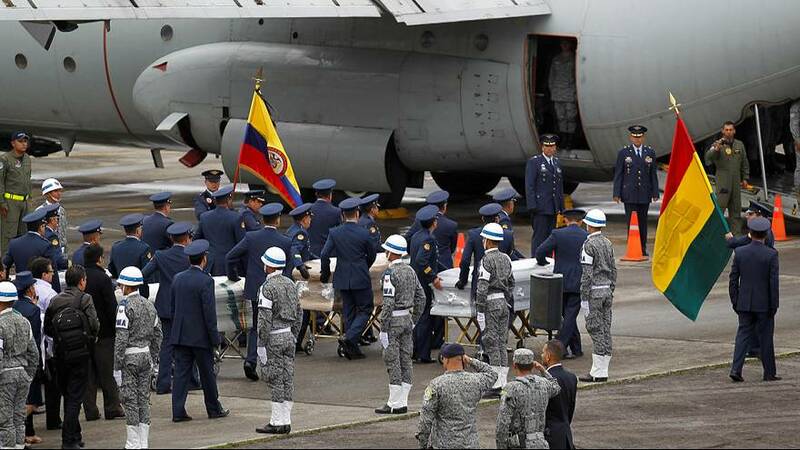 Coffins bearing the bodies of those killed in the Colombian plane crash earlier this week have begun leaving Medellin to be flown home. Five Bolivian victims left on a Hercules aircraft on Friday. The bodies of the 64 dead Brazilians were also due to head back. Funerals are due to take place on Saturday in Chapeco, the small town that was home to the Chapecoense football team wiped out in the disaster. Colombian police have released a video of a survivor from the night of the crash. Erwin Tumiri, a Bolivian member of the flight crew, escaped with only light injuries. He is seen calling out for his lost friends and colleagues. Only six of the 77 people on board the BAe 146 airliner survived in total. Three of them have been looked after at the Somer hospital in Rionegro. “Together with Bolivian doctors we’re diagnosing Erwin with regard to his condition to check whether to discharge him to go back to Bolivia tomorrow or the day after tomorrow. He is in good condition now. But I’m not sure the other patients can leave soon,” said Ana Maria Gonzalez, the hospital’s president. A footballer who survived the crash has been told he may play again, according to reports quoting his father. Helio Hermito Zampier Neto was said to be in a stable condition after surgery. Bolivia’s President Evo Morales has vowed to take “drastic measures” to determine what caused the crash. Earlier this week the country suspended the charter airline’s Lamia’s licence. The evidence so far suggests the plane ran out of fuel, lost electrical power, and was preparing for an emergency landing before it crashed. Reports from Brazil say some famous footballers such as Ronaldinho, Juan Roman Riquelme and Kaka have offered to play for Chapecoense for free, amid a wave of solidarity for the decimated club. On Saturday the focus will be on the human tragedy with an open-air wake in Chapeco. Coffins of players, staff and journalists will be displayed in the team’s stadium.